Both the Gospels of Matthew and Mark record Yeshua’s encounter with a Gentile woman who had come to him begging that he exorcise a demon from her daughter. With our modern, egalitarian perception of Yeshua we would think that he would immediately have compassion on this unfortunate girl and agree to help. However, the Gospels record for us what may be the Master’s most shocking response to our Western ears. He told the woman, “It is not right to take the children’s bread and toss it to the dogs” (Matthew 15:26). What? Did he really say that? Why did Yeshua make this seemingly racist statement against this poor Gentile woman who was begging for his help? How do we deal with this? Some people would like to censor Yeshua’s words, while others would like to claim that some Gentile-phobic Jewish editor slipped that into the text shortly after it was written. This passage is definitely a stumbling block for people considering faith in Yeshua. In a time when we are being told to “unhitch” ourselves from the Jewish Scriptures and the Jewish foundations of our faith this passage can add fuel to the fire. In both passages we see two things that overlap. First, there is an issue of how to deal with meat that is not permitted to the Children of Israel. Second, there is a statement that the Children of Israel are consecrated (i.e. holy) to the LORD. The passage in Deuteronomy seems to be a clarification of the passage in Exodus, explaining that the forbidden meat may be given or sold to Gentiles (i.e. “dogs”). From this connection arose the use of the term dog (Hebrew kelev) for a Gentile. But is this necessarily bad? Dogs are animals that live by their animal instincts. They can’t help the way they have been created. 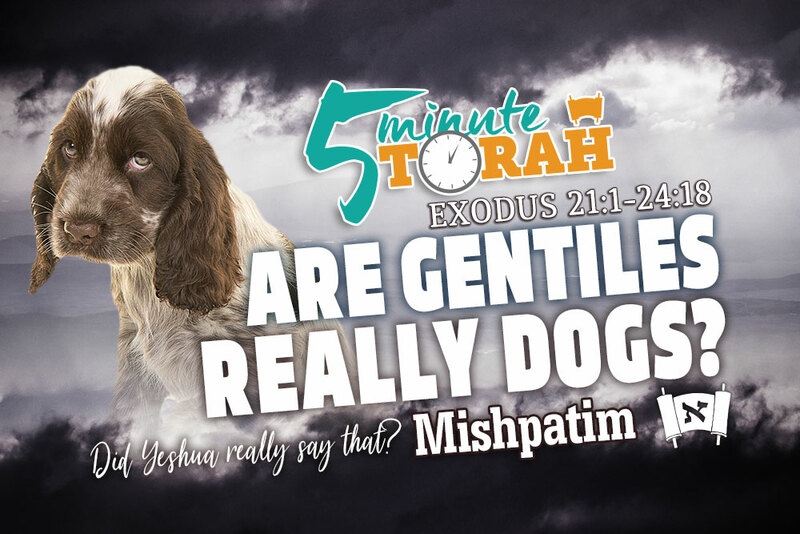 While the Torah seems to refer to Gentiles as dogs it is referring to the ones who live by their animalistic instincts and pagan ways. As we have seen, however, as Gentiles we have the ability to rise above our base nature and be lead by our spiritual nature. When this happens we transition from a dog to a man and even have the potential to rise to the level of a tzaddik. Although Yeshua’s call began with the Jewish people, it wasn’t exclusive to them. He calls the entire world to “deny themselves and take up their cross and follow me” (Matthew 16:24). When Yeshua referred to the Gentile woman as a dog she didn’t show any sign of offense. She didn’t divest & boycott Israel, start a website to “expose” the Talmud, declare the Torah to have been replaced, or “unhitch” herself from everything Jewish. She simply turned the situation to her advantage. In true humility she replied, “Even the dogs eat the crumbs that fall from their master’s table” (Matthew 15:27). When Yeshua heard her response, not only did he immediately grant her request and heal her daughter, but he also praised her for her great faith. Rabbi Abraham Twerski said, “Even if you are what your parents made you, if you stay that way, it is your own fault” (Visions of the Fathers, p. 111). What he means is that throughout our lives we are supposed to grow, change, and develop. If we simply remain who we were when we were born then we have thrown away an invaluable opportunity. When we are confronted with the fact that Gentiles are viewed differently by not only rabbinic texts, but the Torah and Yeshua as well, we can respond in one of two ways. We can begin attacking like a dog and thus truly show we are one, or we can respond in humility and show our humanity. Are Gentiles really dogs? We can’t help the way we were born. However, we can determine whether to remain that way or not. The choice is up to us.